This just in! 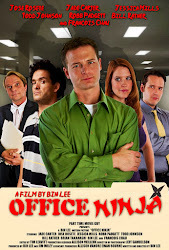 Kirsten Walsh of Rogue Cinema just gave a glowing review of Office Ninja! W00t! Check out her article at http://www.roguecinema.com/article4467.html. Sound the trumpets! Speaking of music, our composer, Dorina Arellano will be on this Tuesday's PTMG Podcast to talk about scoring, and the upcoming World Cup!